The CyberPower CP685AVR UPS is the ideal unit for basic to mid-level computer systems. The 685AVR not only guards against surges, spikes, sags, and brownouts, but also protects your computer system and valuable data during a power outage. The Automatic Voltage Regulation (AVR) monitors incoming AC power and regulates output to a smooth, consistent 120 volts. This model also has full dataline protection: RJ11/RJ45 (phone, fax, Ethernet, network, DSL) and RG-6 coax (DSS, cable modem, satellite, cable TV). 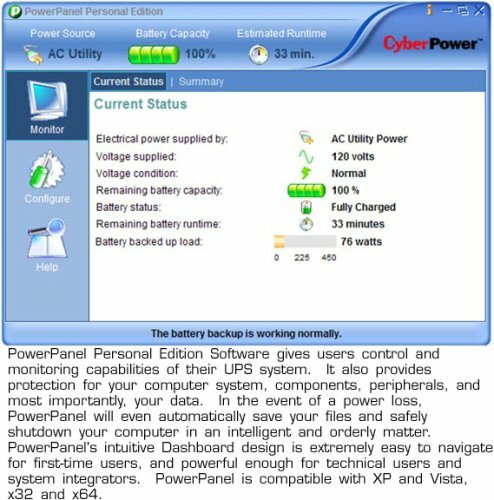 PowerPanel PE Power Management supplements the backup/surge protection by monitoring the vitals of the UPS and safely shutting down your system in event of a power outage. The standalone designs allows for vertical, horizontal, or wall mount. "Surge-Only" outlets are perfect for the addition of peripherals such as monitors, printers, scanners, iPods, or CD/DVD players. I was told that an uninterruptible power supply was the only thing that would protect my devices plugged into an ungrounded outlet, that a "line conditioner" like this one, that would even out any spikes, dips, or surges, was my only line of defense, that all the surge protectors and GCFI fixtures in the world wouldn't do what this thing does, epecially since most electricians wouldn't even bother with the job of ripping out 60 year old wiring and replacing it with grounded circuits, were anyone able to afford such an overhaul. I've owned this product for a couple months now, and only experienced a brief outage or two, but this battery backup has performed flawlessly. The load for this unit is perfect for home use, but be aware that only 4 outlets are surge- AND battery-protected - - this is fine if you choose your components wisely (there's no reason to plug some items in to the battery-protected outlets). The software is easily installed and can gracefully power down your PC during an extended outage. Purchasing this item for a client of mine, we have purchased over 100 of them. When on battery, the unit stays on for over 10 minutes with a standard high end pc with a lcd monitor. We just purchased another 20 and with FREE shipping from Amazon, over $193 in shipping costs were saved. The price was comparable with the APC ES550 and this unit has 8 receptacles instead of the 6 on the APC. The replacement batteries is slightly more expensive than the APC's, but they hold slightly more juice. The Cyber Power 685AVR arrived on time which is always a good thing. What I like about it the most is that it's small yet power-packed. It has the basic number of primary plug sockets (total of 6) 3 surge protector/backup and 3 surge protect only for your monitor, cpu etc. The unit also provides protection for your network which is also the norm on many UPS units, but it's amazing to find this on one that's so compact! The unit is a nice size too for placing under a cramped desk. This unit even worked perfectly in a friend's RV when we went camping for a week. We ran the laptop and also small flat screen television while they were plugged into the UPS. It's small size made it inconspicuous. So far this has been the best UPS I've purchased. I've only had it for less than a month so I cannot comment on battery life, but I presume it will offer what other units of its size and power offer. Don't let it's small size fool you! I've given this item only 4 stars not because of anything negative but because it's only fair considering I've only had the unit for a few weeks to date. I'm totally satisfied so far however. not much to it but I like the fact that it does not have a fan because I have enough of those in my computer room. good size a little heavy but maybe thats a good thing. The length that the battery lasts on this is well worth the money. 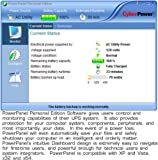 I have not tried to configure it to automatically shut down my computer; I'm not sure I want to worry with that with Vista. The only negative I have for it is that, while the power is out and the battery is being used, it beeps at a regular interval that is too frequent. When the power goes out, the house is completely silent, except for this thing beeping every couple of minutes. I understand that the function of that is probably to alert me that it is being used and therefore will run out of power at some point. However, it would be more useful if it beeped once when it first has to come on and then maybe when it is at 50% power and possibly again just before shutting itself down. I end up turning everything off as quickly as I can that is plugged into it so that I can turn the battery off to stop the beeping. Unless you have a system running their power monitoring widget, the UPS function doesn't work. Case in point, I have a Linux system running mythdora and every time I have a power blink, the box reboots. If I have my XP system with the widget running, the UPS functions properly during a power blink. My APC unit does not require the APC widget to be running to keep power to the outlets. Poor design, I guess they never considered someone using a UPS for something other than a Windows or Mac desktop, like a switch, cable modem, etc. Caveat, my unit is about 2 years old, so maybe they fixed this issue.